Warframe isn’t the best game I’ve ever played, but it sure is one of the best supported. What began as a relatively simplistic third-person shooter with acrobatics and corridor shooting now includes dozens of classes, an arsenal of hundreds of weapons, jetpack battles, and fights with 60-foot ghost bugs. The updates keep getting bigger, too. Warframe once mainly took place in corridors, and then they added an open world. It didn’t have much of a story, and then it got some of the weirdest, most intricate science-fantasy plot I’ve seen this side of Destiny – minus having to read the good bits on my smartphone. Now the game’s next steps, announced at the game’s official fan event, TennoCon 2018, sound more ambitious than ever. 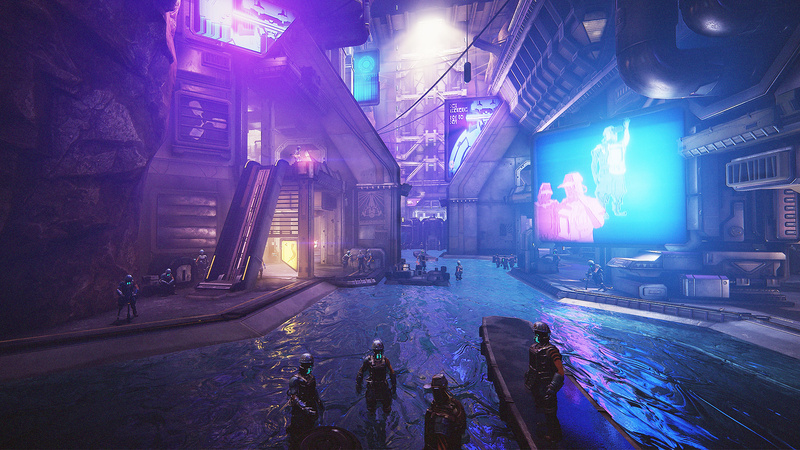 The double announcement was for Fortuna – a second, larger open-world area following in the footsteps of 2017’s Plains of Eidolon update – and Railjack – spaceship-to-spaceship combat with a cooperative hook. Either announcement would be impressive on its own. 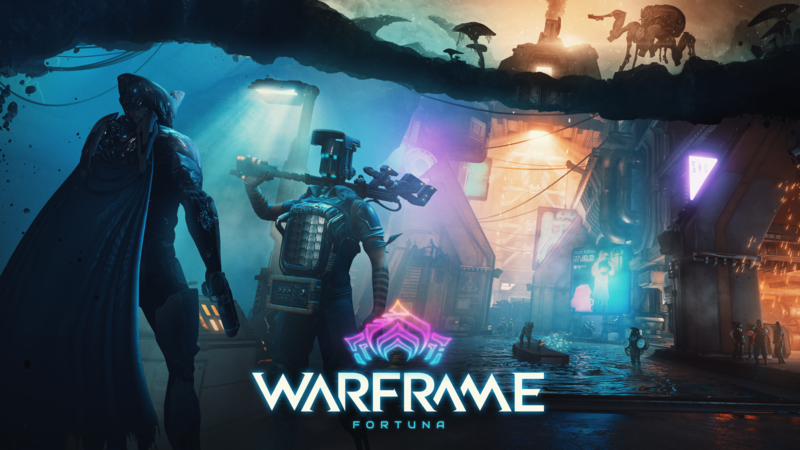 Fortuna sounds like it will address some quality-of-life problems that plagued the plains, while Railjack is yet another completely new style of play to add to Warframe’s growing pile. But I’m especially excited about how the two systems interact. They’re not totally separate, like most of the game’s disparate activities, but seamlessly connected. The TennoCon demo showed two developers flitting across the icy lands of Venus one minute (on newly announced hoverboards, no less). The next moment, the pair hitched rides aboard a flying frigate and broke for the stars. They were blasting bad guys, boarding a capital ship, and destroying them both within seconds. The only delay was what looked like a cleverly hidden load as the starship broke through clouds. It was impressive, to say the least, and the live TennoCon audience ate the news right up. There was a similar reaction to the now comparatively tame reveal of Plains of Eidolon just one year ago. It’s hard to discount the spectacle in either case. But the subtler implication that Railjack uses every part of Warframe’s techno-buffalo – open-world exploration, the new space battles, jetpack-based combat for boarding, and finally the game’s classic corridor shooting aboard enemy ships – is just as encouraging. Yet it doesn’t sound like any one aspect will be strictly mandatory. Railjack simply determines a rhythm for the player. I can already see myself burning through all of Venus’ time-limited bounties (a common occurrence in Plains of Eidolon). Except instead of returning to home base and deciding what to do from there, I might conclude things by blasting off to battle with a dreadnought. And the resulting raid would necessarily offer a taste of everything I might do anyway. There are some caveats. Developer Digital Extremes was quick to show that completing Fortuna bounties will reward players with customizable weapon parts. That’s potentially exciting. Plains of Eidolon did something similar, but grinding for that expansion’s pieces is a sore chore for little payoff. What’s worrying is how they didn’t address Railjack’s rewards at all. And usually, when Digital Extremes doesn’t include a major detail like that, it’s because the devs haven’t even decided yet. They admitted as much themselves throughout the convention. Kudirka says Railjack is meant to be “closer to endgame stuff,” however. And that role carries a certain amount of weight. Speaking of which, I’m curious how much I’ll have to contend with my fellow players, personally. I tend to play Warframe semi-solo – only teaming up with match-made, mutually silent strangers. But Railjack seems complicated. One player pilots the ship while up to three others man guns, put out fires, bash boarding parties, and infiltrate the opposing ships themselves. In the demo, the pilot was also responsible for managing systems like shields and weapons. When their partners leave to attack opposing ships, it’s a pilot’s job to hack “door locks, turrets, shields, and anything [Digitals Extremes] can think of” to put in players’ paths. It looked neat! It also looked like the kind of thing that requires coordination that randoms can’t always provide. Yet Kudirka admits Railjack will need just that: coordination and “communication outside the game.” A command console aboard the ship is meant to help with that, but it obviously can’t force ill-meaning players to do what they’re supposed to. Until we know for sure how difficult and rewarding the spaceship combat will be, I’m less reservedly optimistic about Fortuna. 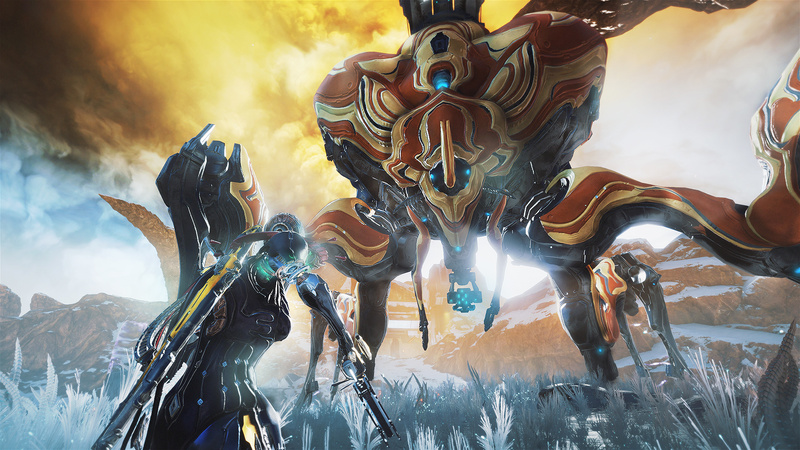 Meredith Braun, Vice President of Publishing at Digital Extremes, referred to Plains of Eidolon as a sort of proof of concept. 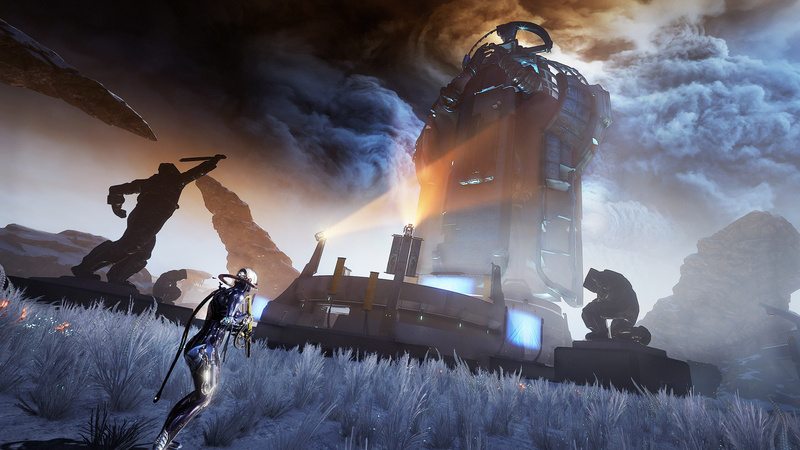 It showed the studio could make an open-world area work in Warframe. In turn, the players showed it was something they wanted. Now Fortuna is the concept writ large. I mean that literally. Braun called the Venus landscape about five times bigger than Plains’ earthbound area. It’s also clear even from the short demo that the structures dotting the land are much more imposing. The players dipped into tunnels, popped up in front of 20-foot statue of an annoying man’s face, and concluded the tour by the rest of the sculpture. The headless colossus was big enough to spew giant spider tanks from its face-hole. The machines were no match for our intrepid demo-givers, but the much larger mama spider that crested a mountain next was enough to make them retreat. The missions that will send players into Fortuna are provided by Solaris United. And that new faction is certainly striking. Each member is a cybernetic laborer. Their bodies have been chopped up and sold to pay off crippling debt. Heads must be especially valuable, too, since nearly all the NPCs have robotic cubes in place of natural noggins. Kudirka explained that Fortuna’s themes of debt and servitude came down from Steve Sinclair, Warframe’s director. Neither developer seemed keen to draw direct parallels between the game’s fictional laborers and real-world economic crises. But Sinclair did specify his distaste for predatory bank loans – particularly those targeted at the elderly. I would have preferred a more direct addressal of real labor rights, particularly since game development is no stranger to that kind of strife. Yet it’s nice to see you’re unequivocally running missions for the downtrodden. The missions shown included liberating Solaris bases (by murdering enemy soldiers) and hunting wild animals. The latter mission is intended as a “non-violent Deer Hunter” alternative. You’re actually meant to preserve Venus’ endangered species by tranquilizing and transporting them off-site. The whole thing relies on a mini-game that, honestly, looked a little fiddly. You basically have to listen for creatures and match the pitch of their cries with a sci-fi duck call. It seems like an easy thing to mishear. I must say, though: helping literal wage slaves damn the man in the far future is exactly my kind of story. Kudirka hinted that there’s more to said story than in Plains of Eidolon, too, as “players have some effect” on the plight of Solaris United. TennoCon 2018 concluded with a brief teaser for Warframe’s next cinematic story quest. Even that, the game’s fourth such quest with full cutscenes and major story revelations, seemed heightened in the full swing of new announcements. The trailer showed an army of the game’s main antagonists, the Sentients, prepping for battle. That might have something to do with the quest’s title: The New War. It’s worth noting that The Old War was a downright apocalyptic event in Warframe’s fictional history. There’s some fitting symmetry to the name. A healthy mix of old and new conflicts is exactly what Warframe’s new updates promise. Though I could still use some more info on what exactly that promise entails. What are the rewards for Railjack? Will there be more to do on Venus than kill bad guys and capture animals? Will I be forced to interact with other human beings? Digital Extremes didn’t give strict release dates for the updates, although Fortuna, at least, is planned for “sometime this year.” So there should be plenty of time to find out more.